Far more has been written about the crusades than the states they established and supported. Yet it was the threat to the Christian states that justified every crusade after the First. Furthermore, the crusader states were catalysts for a number of key developments in Western Europe from dramatic improvements in shipping to the exchange of goods, technology and ideas with Constantinople and the Arab/Turkish world. Indeed, historian Claude Reignier Condor wrote at the end of the 19th Century that: “…the result of the Crusades was the Renaissance.” (The Latin Kingdom of Jerusalem 1099 to 1291 AD, The Committee of Palestine Exploration Fund, 1897, p. 163. )Professor Malcolm Barber, a distinguished scholar who has already produced seminal works about the Templars and Cathers, has produced a long overdue work that provides a comprehensive history of the crusader states rather than the sporadic crusades. It is meticulously researched and documented, as one would expect from a professor of history, and as such is an invaluable reference work for anyone interested in the period and indeed in the West’s presence in the Near East. Whereas histories of the crusades invariably focus on military campaigns and so on “aggression,” Barber reminds us that the crusader states themselves were builders rather than destroyers. Barber concludes his comprehensive history by noting that: the crusaders “pragmatic approach to the challenge of providing for defense, administration and economic development produced political entities which resist stereotyping…and predetermined models.” He furthermore stresses that their accomplishments cannot be reduced to military conquests but also “entailed the rebuilding and embellishment of the holy shrines” and notes that they “ultimately produced their own independent and vibrant culture.”Barber draws on a wide range of primary and secondary sources in Latin, Arabic, French, and German, and his bibliography alone is a treasure trove for the historian. However, the very detail of his account tends to slow the pace and complicate the flow of the narrative. This is more a reference or a research resource than a good read. A good book, a pleasant book even, but not a great book. The title doesn’t quite cover the content; it seems to at first, with a more general chapter about climate, social attitudes etc. after the chapter about the establishment of the Crusader States, but after that it quickly becomes a political and military history of the Crusader States. There’s nothing wrong with that, but it’s not quite what the title leads you to expect. There are some later attempts at a wider perspective, like a part about Christian architecture in the Holy Land, but on the whole the last 60% of the book is almost completely taken up by a military-political narrative.It doesn’t help that Barber doesn’t really offer any new perspectives either. He gives a few different interpretations, but not enough to really stand out. All in all it feels a bit bland, like a big summary of the larger subject, despite Barbers obvious knowledge of and familiarity with it. Like other reviewers, I was disappointed that this became a political-military history in spite of the title.A curates egg. I guess a broader social history of the colonisation remains to be written. Nuts on the medievals growing up (one of my favourite books was an old textbook on The Middle Ages), somehow it took me decades of reading Walter Scott and GA Henty before I realised--courtesy of Ronald Welch's book Knight Crusader--that in fact the Crusades did not just produce expeditions from Europe to the Holy Land, but also set up vibrant Christian states there, which managed to hang in there, in one form or another, for two hundred exhausting, blood-soaked years. From that moment I've been fascinated by this history. In Malcolm Barber's The Crusader States, I've finally found a solid, detailed, even-handed history dedicated to the astonishing first century of those crusader outposts.This is a tremendously important book, but not easy to read. I crunched through it in a couple of rather strenuous weeks, feeling my way through a dense and often quite dry succession of names, dates, battles, and crises. Dr Barber is here to give you the most comprehensive history he can manage, and sacrifices readability in the process; but for one who wants to know details on climate, architecture, political maneuverings, demographics, and geography, his book is indispensable.One of the things I particularly appreciated about this book is Dr Barber's very enlightening interaction with all the major chroniclers of the period, from Fulcher of Chartes and William of Tyre to Ernoul and Ambroise, to say nothing of various ibn al-This and Thats. Barber weighs different accounts, and comes to his own conclusions, as well as providing helpful commentary to assist in my own reading of these chroniclers. Though often dry and detailed, it would be impossible to read some parts of this history without emotion; these beleaguered outposts were, in a very real sense, the beating heart of medieval Christendom, never forgotten even once lost. The chapter on the battle of Hattin is itself worth the price of the book--not just the grand epic tragedy of the battle itself, and the spine-chilling defiance of Balian of Ibelin and Jerusalem in the aftermath, but also, juxtaposed against these epic events, the heartrending detail of the church of Nazareth, never finished, which in the face of these apocalyptic events continued to be built in hope.My only real complaint is that the book ends with the end of the Third Crusade and doesn't finish the second half of the story, up to the 1290s. But it is in any case a solid and much-needed history book. A clear and detailed but unremarkable account of the first hundred years of the various territories established in the Near East in the wake of the First Crusade (1095-1099). Malcolm Barber is a leading historian of crusading and the military orders, and he demonstrates the extent of his learning in this book, a work of real scholarly synthesis. 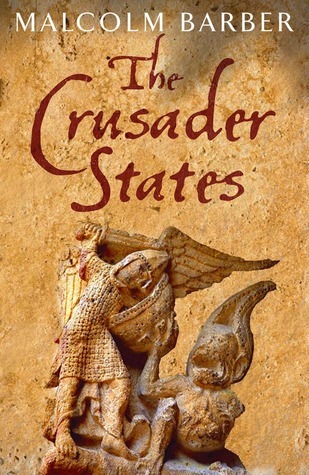 Seemingly aimed at a general readership, however, The Crusader States is unlikely to appeal to historians who have encountered much (if not all) of this story before, and even non-specialists may find it tough going at times due to the sheer amount of names, events and places discussed. Despite some promising remarks in the preface (p. xii), Barber's account is for the most part a political and military narrative peppered with some colourful excerpts from the sources but noticeably lacking in sustained treatment of cultural and socioeconomic considerations. The evidence, to be fair, only goes so far in this respect, but the book would have been enlivened by further discussion of these areas. The Crusader States is essentially a useful introduction for readers with little or no prior knowledge of the subject, but disappointing for those who are looking for new insights into or interpretations of the much-studied chronicle sources. [Read the first 100 pages for a Medieval Mediterranean seminar. ]A history of the Crusader states is a welcome addition to the field. Parts of it were quite intriguing, but on the whole it was unbalanced. General descriptions were clear, though some of the interpretive framework was questionable. At times it descended into a dizzying list of names and actions. I think a problem with this book is intended audience. For a popular audience, there are a lot of actors to keep track of simultaneously. For scholars, there are a lot of unsubstantiated assumptions and loose ends. And yet, I think I would finish this book, because there isn't much else on the topic, and when Barber is good, he's very good. Would be four stars, except that it wasn't quite what I was expecting. It's a very interesting narrative history of the Kingdom of Jerusalem (and the counties of Antioch and Edessa), with a real focus on the states themselves, rather than the more famous episodes of the 1st and 3rd crusades. But I got the impression it would focus more on the government and economy of the states, rather than being just a narrative history, hence only giving 3 stars. I was looking forward to reading this book but was seriously disappointed when I finally did. The author took a fascinating subject and turned it into an endless list of names and events mentioned in passing with little analysis to connect them together. I would recommend reading another book about the Crusades. I read 1/3 of this. It wasn't that you couldn't see the forest for the trees, it was that there was no forest at all.... Like other reviewers, it sometimes seemed to me to be a list of names ("trees") with no larger story ("forest"). I really kept trying, thinking that maybe I wasn't concentrating enough so I was losing track of the actors. But I finally gave up this morning. Malcolm Barber - British historian who specialised in the Knights Templar. Professor of Medieval European History at the University of Reading for many years until his retirement. Free eBooks Paydayloansuktrh.co.uk Library is in no way intended to support illegal activity. We uses Search API to find the overview of books over the internet, but we don't host any files. All document files are the property of their respective owners, please respect the publisher and the author for their copyrighted creations. If you find documents that should not be here please report them. Read our DMCA Policies and Disclaimer for more details. Copyright ©2019 Free eBooks Paydayloansuktrh.co.uk Library - All rights reserved.